Safe for Now - Can have an off-year and be just fine. Needs a Good Year - Needs to improve. Needs a Great Year - Could be the end if things don't get better fast. The date was September 7th, 2013. A fresh-faced Darrell Hazell and his 1-loss Boilermaker squad, who had just been trounced by Cincinnati 42-7, took the field against Indiana State to play a contest of American collegiate football. Purdue dispatched their Missouri Valley FCS foe...eventually...by the score of 20-14. Then it all sorta went downhill. When you Google "Darrell Hazell", this is the 3rd result behind his Wikipedia page and his official Purdue page. I don't know what 2014 is going to bring. The schedule is a lot easier with Western Michigan, Central Michigan, and Southern Illinois as three very winnable non-conference games. Purdue also gets Illinois, Northwestern, and Indiana in the conference who won a combined five Big Ten games, two of them over Purdue and two over Illinois. A turnaround is far from impossible, but Hazell is already hearing the hounds at his door. Fans want to see improvement next year in the form of wins and at least competitive losses. Hazell needs to take a serious look at his assistants like Bridge, John Shoop as offensive coordinator, and Carter on the defensive line because those units were universally awful. Such is life in West Lafayette these days. Hazell has a major job to do to get Purdue back to the middle of the pack. Wouldn't ya know it, Illinois snapped its 20-game Big Ten losing streak last year! Thanks a lot Darrell Hazell and Purdue! Believe it or not, there was speculation that the 2nd year Beckman might not be asked to return to lead the Illini in 2014. AD Mike Thomas put those rumors to bed in December, but they were out there. However, while it may not be obvious to outside observers, there was significant improvement from the Illini in 2013, particularly on offense where a unit that averaged only 16.7 points per game last season averaged 29.7 points per game this season. However, that improved offense wasn't enough to make up for a defense that finished 112th in the nation in total defense, allowing 481.5 yards per game and 35.4 points per game. True dat. Defense is important, and is now the emphasis going forward. You might assume a coordinator shuffle could help improve things, but that's not the case. DC Tim Banks will remain on board to lead the embattled Illinois defense in that can only be considered a "bowl or bust" type of season for this entire coaching staff. And boy oh boy does their schedule not do them any favors. This is basically the Big Ten West equivalent of Michigan's schedule. All of their notable games are on the road. 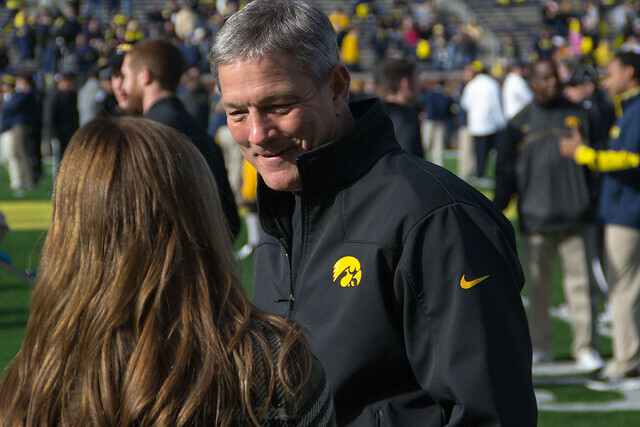 The simple truth about Kirk Ferentz is that he's had some elite levels of success peppered throughout his 16-year Iowa career. He's a fine football coach, but he's struggled to reach those same levels of success the past few seasons. But his contract, more specifically his buyout, will keep him at Iowa for a long time. Last year's 8-5 (5-3) record helped cool off the hot seat a little bit. I said he needed a good year and he delivered...buying him some time. But despite having a good year, Iowa was never really in the conversation when it came to the Legends division title and a trip to Indy. But they did knock off Michigan and Nebraska late in the year. I really can't tell you how Iowa will do this season. Their schedule is very favorable, so anything less than 8 wins should be unlikely. With this schedule and a west division that is ripe for the picking, Iowa could be a dark horse for Indy. I wouldn't count them out. Jerry Kill received a contract extension and a healthy salary bump just this past February. So if that's any indicator, I'd say he's doing well. Minnesota officials have also announced that desperately needed facility upgrades are on the way. Kill has gone 3-9, 6-7 and 8-5 in his 3 seasons at Minnesota. That's a trend that Gopher fans have been desperately waiting for. Despite distractions due to his health, Minnesota has no plans to part ways from Kill. Last year I said Kill needed a good year and that I could see 7 wins on their 2013 schedule. The win that they got that I didn't see was Nebraska. Jerry Kill got his good year and Minnesota is now in a position they haven't been in quite some time...the hunted. I see 7 wins on this year's schedule as well. A win against Iowa on Nov. 8th could send the Gophers into their final 3-game death march on a high note. From there, you never know. I'll let Adam Rittenberg and Brian Bennett of ESPN take this one. BB:You'd have to suffer from amnesia not to remember how close Bo Pelini came to losing his job at Nebraska last season. But is it fact or fiction that he's on a hot seat? AR: Fact. I'm not sure where the pro-Pelini push is coming from. Does a bowl win and some Twitter fun with @FauxPelini really change anything? Nebraska has been a bigger national story during its spring game the past two seasons than when the games actually count. While it's nice to this side of Pelini, the only thing that matters is winning more games and getting Nebraska that elusive conference championship. Agreed. But I wouldn't be so quick to dismiss the impact of a bowl win, especially against Georgia. Anyone who delivers a Big Ten bowl win against the SEC is immediately ushered to the front of the proverbial line...and you saw that this offseason with Pelini's antics on Twitter and his spring game kitty. Nebraska is a national brand and a perceived powerhouse, so offseason fluff (ahem) will only take you so far. I agree with Adam that Nebraska needs to deliver more than just 8 or 9 wins. Nebraska measures success by national titles, not Twitter followers. Northwestern ran the emotional gamut in 2013. They were a preseason media darling, and a legitimate contender for the Legends division. The obvious high-water mark for the season was October 5th when they hosted #4 Ohio State in primetime. College Gameday was in town and all eyes were on Fitzgerald and the undefeated 16th-ranked Wildcats. After that tough 30-40 loss, Northwestern's season completely fell off the deep end with a 7-game losing streak. November 2nd in Lincoln and November 16th against Michigan at home have to rank as two of the most heartbreaking back-to-back losses any team has ever had. When 2013's expectations were so high, and NU fell flat on their face, that only raises the bar for 2014. They have a lot of ground to make up, and key players to replace. That said, NU will never fire Pat Fitzgerald. Players love him, fans love him. He's a national treasure in Evanston...bowl games or no bowl games. Year one under Gary Andersen was pretty decent if you're a Badger fan. Wasn't great....wasn't bad. Went to a respectable bowl and lost...which pretty much sums up Wisconsin's 2013. The real test will be what Andersen can do in year 2. Will Wisconsin improve? Last year, Andersen's primary goal was take his bounty of talent that he inherited and make hay while the sun was out. 9 wins isn't anything to scoff at, but that senior-laden team was probably capable of more had Bielema stuck around. Year 2 for Andersen is where the rubber meets the road. Questions abound as to who the starting QB will be...as well as question marks at other positions No doubt, Wisconsin fans aren't used to feeling this uncertain heading into summer. While sure, Andersen is far away from a hot seat, all eyes will be on him if the Badgers slide down the Big Ten standings this year. What's that? You missed our B1G Coaches Hot Seat East Divison post? Well check it out here.